Yael Designs' "Knot" tanzanite and diamond ring wins the 2015 JCK Jewelers' Choice Awards in the Tanzanite Jewelry Under $10,000 Category. Inspired by the social connections that enrich our lives, this 18k white gold ring features a 7.40 ct. tanzanite accented with 0.64 ct. t.w. colorless diamonds. 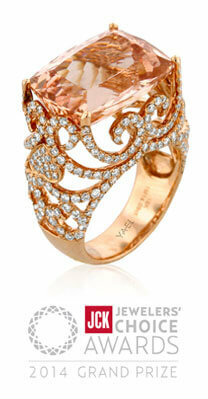 Yael Designs' "Baroness" morganite and diamond ring wins the 2014 JCK Jewelers' Choice Awars in the Colored Stone Jewelry Over $10,00 Category and Overall Grand Prize Winner of the Competition. Inspired by the intricate patterns of wrought iron balconies in Paris, this 18 rose gold ring features a 14.09 ct. morganite accented with 2.36 cts. t.w. colorless diamonds. 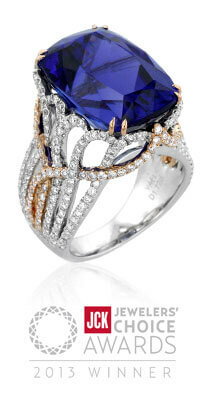 Yael Designs' "Divine" tanzanite and diamond ring wins the 2013 JCK Jewelers Choice Awards in the Tanzanite Jewelry Over $10,000 Cateogory. 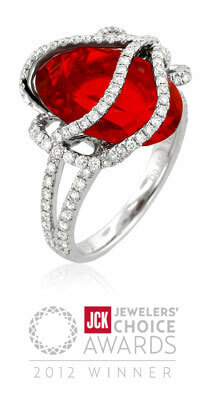 Inspired by the beauty and fury of the Pacific Ocean, this 18k rose and white gold ring features a 19.63ct. tanzanite accented with 1.71 cts. t.w. colorless diamonds. Yael Designs' "Lava" fire opal and diamond ring wins the 2012 Jewelers Choice Awards in the Colored Stone Jewelry $2,501-$10,000 Category. Inspired by the divine creative power of volcanoes, this 18k white gold ring features 6.47 ct. fire opal accented with 0.85 ct. t.w. colorless diamonds. 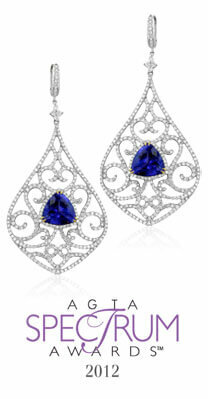 Yael Designs' "Baroness" tanzanite and diamond earrings win the 2012 AGTA Spectrum Awards with Honorable Mention in Bridal Wear. 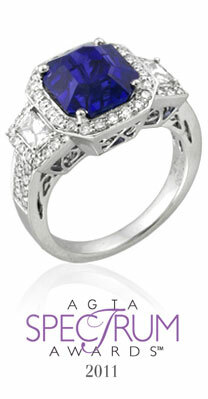 Inspired by the Parisian wrought iron balconies, these 18k white gold earrings feature trillion-cut tanzanites (10 ctw.) accented with diamonds (5.29ctw.). 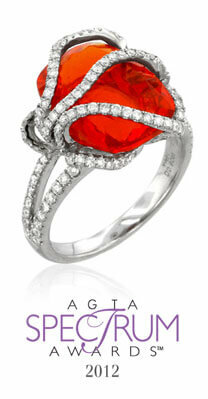 Yael Designs' "Tectonic" fire opal and diamond ring wins the 2012 AGTA Spectrum Awards with Manufacturing Honors in Evening Wear. Inspired by the furious energy of a volcanic eruption, this 18k white gold ring features 5.49 ct. Mexican fire opal accented with diamonds (0.90 ctw.). 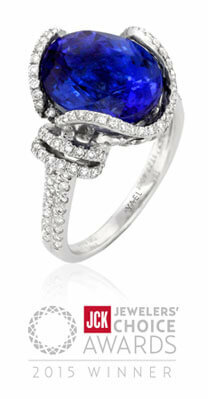 Yael Designs' "Triad" blue sapphire and diamond ring wins the 2011 AGTA Spectrum Awards with Platinum Honors in Bridal Wear. Inspired by the future, past and the present, this Platinum ring features a 6.34 ct. unheated blue sapphire, accented with diamonds (1.03 ctw.). Yael Designs' "Tao" black and colorless diamond earrings win the 2010 AGTA Spectrum Awards with Manufacturing Honors in Evening Wear. Inspired by the concept of duality, these 18k white gold earrings feature black diamonds (1.43 ctw.) and colorless diamonds (2.77 ctw.). 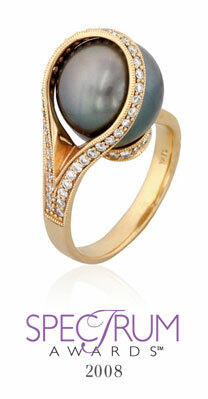 Yael Designs' "Coral" pearl and diamond ring wins the 2009 AGTA Spectrum Awards with Manufacturing Honors in Business Day Wear. Inspired by the organic shape of corals, this platinum ring features a 13mm black Tahitian pearl accented with pave diamonds. 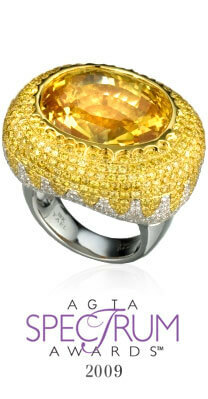 Yael Designs' "Surya" yellow sapphire and diamond ring wins the 2009 AGTA Spectrum Award with Honorable Mention in Evening Wear. Inspired by the warmth and brilliance of the sun, this 18k white and yellow gold ring, features a 60 ct. yellow sapphire, accented with yellow and colorless diamonds (10.0 ctw.). 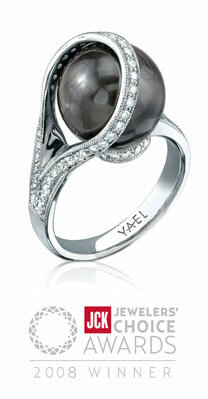 Yael Designs' "Venus" pearl and diamond ring wins the 2008 JCK Jewelers Choice Award in Pearl Category. Inspired by the mysterious member of our galaxy, this 18k white gold ring features 12mm black Tahitian pearl accented with colorless diamonds (0.55 ctw. ).